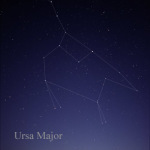 Ursa Major is a circumpolar constellation that was cataloged by 2nd century astronomer Ptolemy. The Big Dipper asterism is perhaps the most easily identifiable aspect of this constellation. As a circumpolar constellation at 40 degrees north latitude, it can be seen at any time on any clear night from a location with an unobstructed view of the northern horizon. 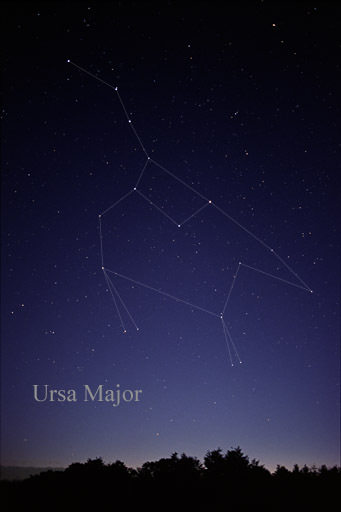 In April, however, Ursa Major reaches its highest ascension at nightfall. All seven stars comprising the Big Dipper were named by the ancients. The Big Dipper’s handle is the bear’s tail and the bowl is the bear’s hindquarter. Upon closer examination and in a darker sky, all of the constellations stars add to the dipper to form a distinct and complete bear. The two Big Dipper bowl stars opposite the handle are the pointer stars that guide the eye to Polaris, or the north star. Following the arc of the tail away from the bowl, a method sometimes referred to as “arc to Arcturus,” leads the observer to the star Arcturus in the constellation Bootes. Starting at the end of the tail and moving around through the bottom of the dipper’s bowl, the are: Alkaid (Eta Ursae Majoris), Mizar (Zeta Ursae Majoris) and its naked eye binary companion star Alcor, Alioth (Epsilon Ursae Majoris), Megrez (Delta Ursae Majoris), Phecda (Gamma Ursae Majoris), Merak (Beta Ursae Majoris), and Dubhe (Alpha Ursae Majoris) . Impress your friends by committing these stars’ names to memory and pointing them out on a late Spring evening when the dipper is high in the northern sky. Ursa Major contains several Messier objects. A famous pair is M81, a nearly face-on spiral galaxy, and M82, a nearly edge-on galaxy, that gravitationally interact with one another and can be see within a single field of view of a modest telescope. M101, 108 and 109 are three other Messier galaxies, and M97, a planetary nebula are also found in Ursa Major. One rather odd Messier object is M40, which is the only double star in the Messier catalog. 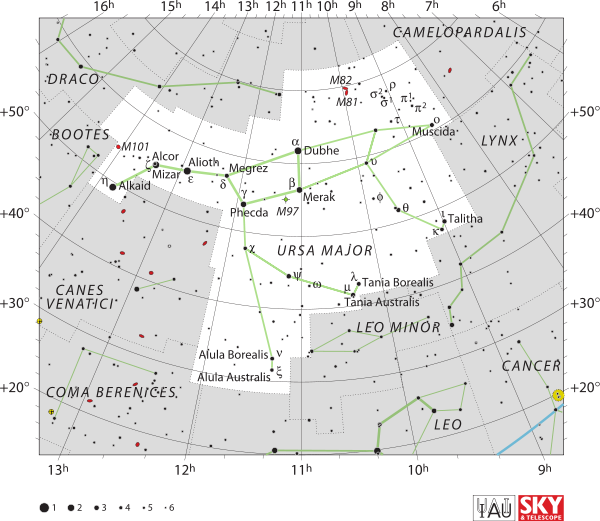 IAU Ursa Major chart, IAU and Sky & Telescope magazine (Roger Sinnott and Fick Fienberg), June 5, 2011.